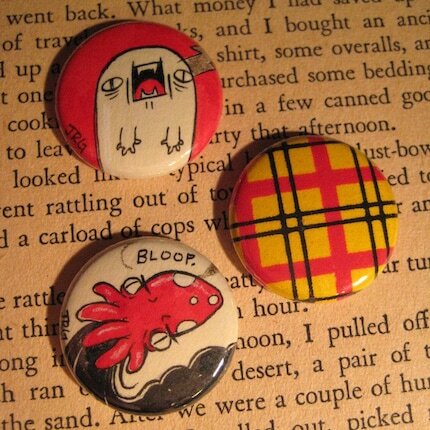 Seriously loving these one of a kind buttons J.R. Goldberg’s selling over at her recently opened Etsy shop. The loony’s actually making these things herself, painting each one individually before encasing it in carbonite (quite safe). 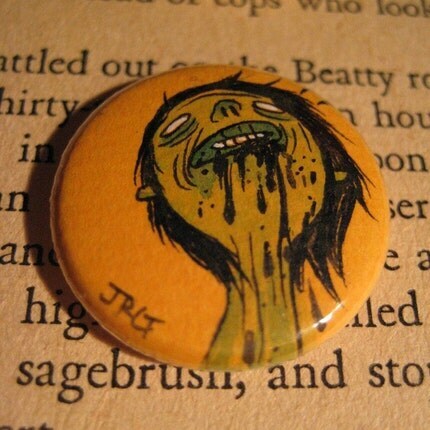 I actually have a few and the thing’s are just lovely, but I got in before she started doing the awesome zombie series, so I’m just a bit jealous of the jerks that grab these I am. This entry was posted in fine things and tagged J.R. Goldberg, squid, zombies on February 24, 2009 by Jhnen VEE. I will pin these to my eyes and enjoy them every minute of my existence. I have no choice but to purchase at least one of her delectable zombies. So tangy and delicious. I HAVE to buy some of these. Pretty, colourful, amazing, encased in carbonite, awesome pictures… uhh, am I repeating myself here? Anyway, I need these buttons. I need them like a heroin addict needs his fix or how a JV addict needs JV’s new art. …It’s morning here, at my side of the planet. Forgive me. I agree; that squid IS a gem. Lovin’ those little highlights on it, too. But what is it you’re reading? bought, sold and paid for. that lovely squid will soon be gushing its hideous black inkgasms all over my house, until my fiance leaves me and i’m fired from my job for showing up covered in squid ink. Those buttons are the stuff of genius. I want a plaid buttona and a gold-toofed zombie. Oh, JG, will you ever disappoint us?